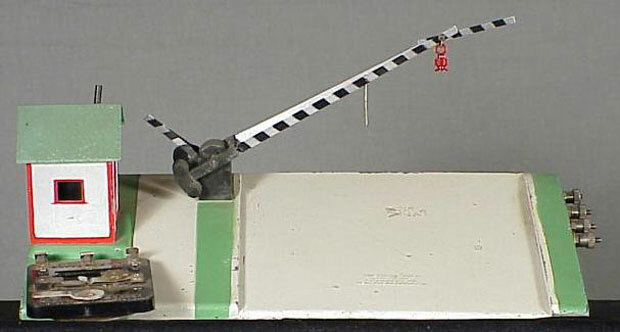 #591 Crossing Gate with 707 track clip made in 1946 thru 1948. It has a painted die-cast base. A light underneath illuminates the lantern on the gate arm. 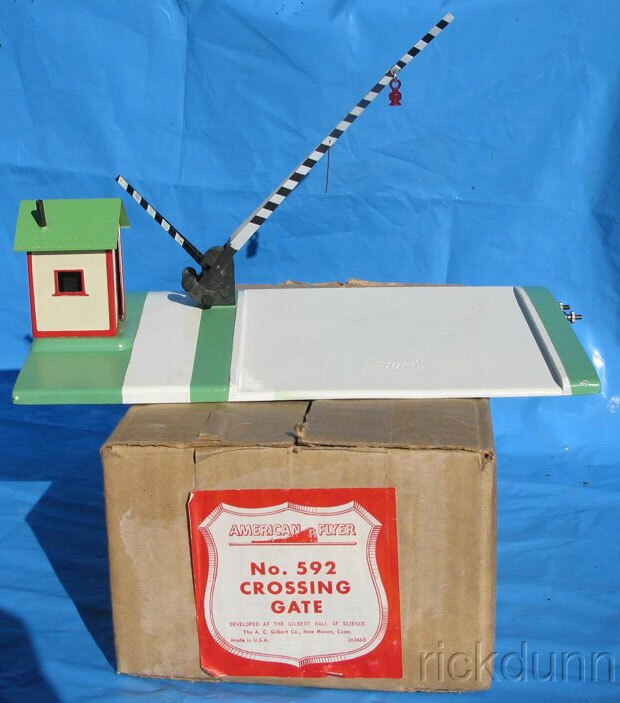 #592 Crossing Gate made in 1949 & 1950. It came with a with #697 track trip. Notice the screw posts on the right for connecting wires. and the two wires were permanently connected. It also came with a #697 track trip. 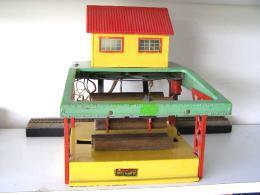 Some bases were diecast, some Bakelite, and some Plaskon (pressed wood). with its distinctive silver painted roadway and sidewalk. The underside is also quite distinctive. 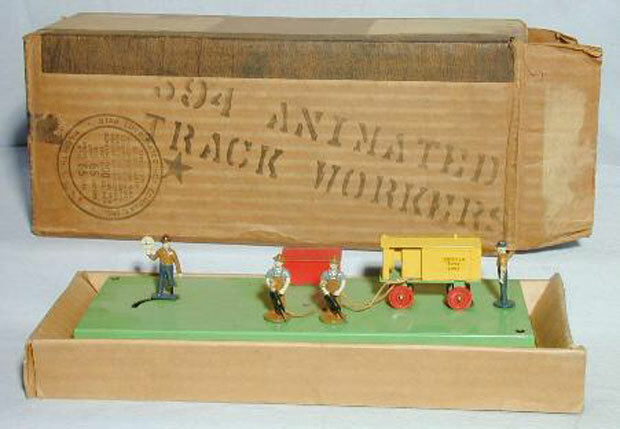 #594 Animated Track Gang made in 1941.
black or gray roof, made from 1946 thru 1956. 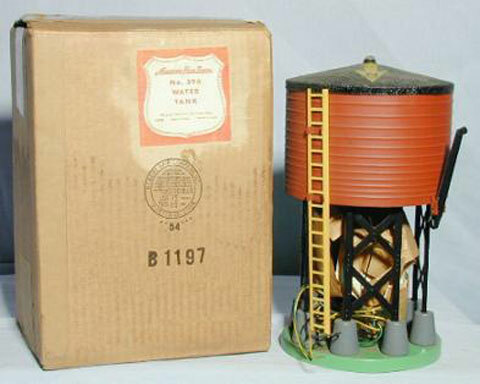 This one has black legs and roof and no weight on the spout. 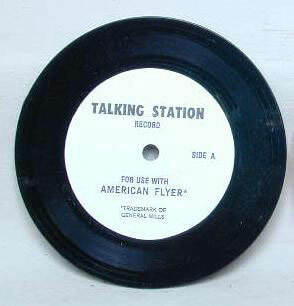 #598 Talking Station Record made in 1948 thru 1956. 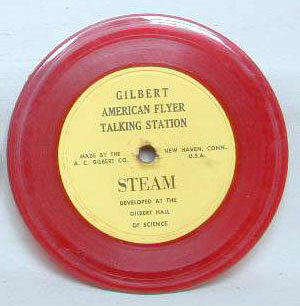 One side of the record has steam engine sounds and the other has diesel sounds. 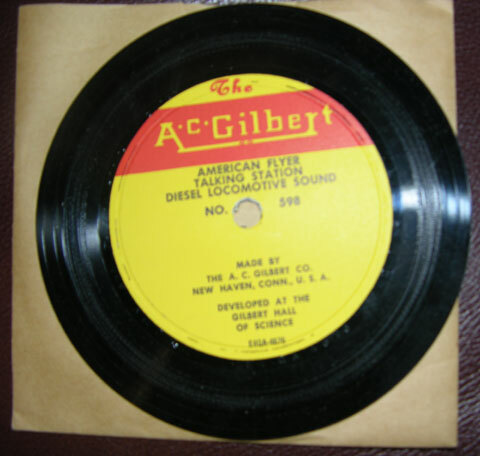 There is a great deal of variety in the labels on the records. On some the colors are the same on both sides, but on others they are not. Some of the records weren't even black! Further, some bear the number 598 and some do not. the number appears only on the envelope it came in. 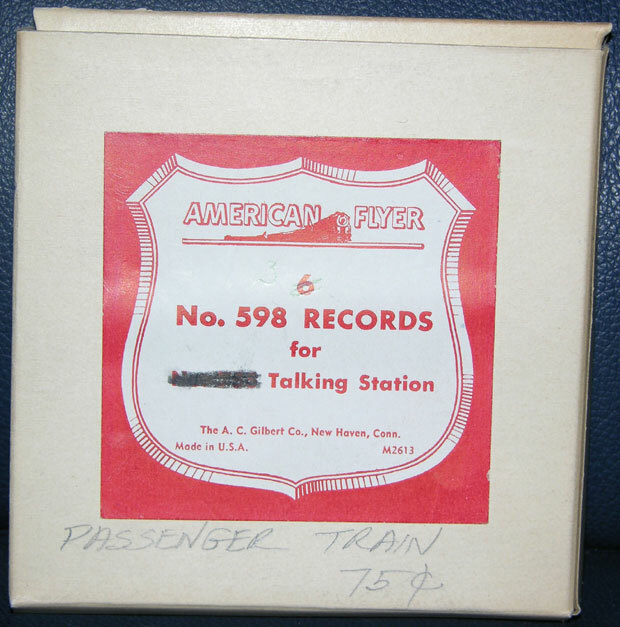 Recors were shipped to dealers in 6-pack boxes like this..
#599 Talking Station Record made in 1956. The labels on both sides are identical. In addition to the engine sounds contained on #598, the #599 record has voices. 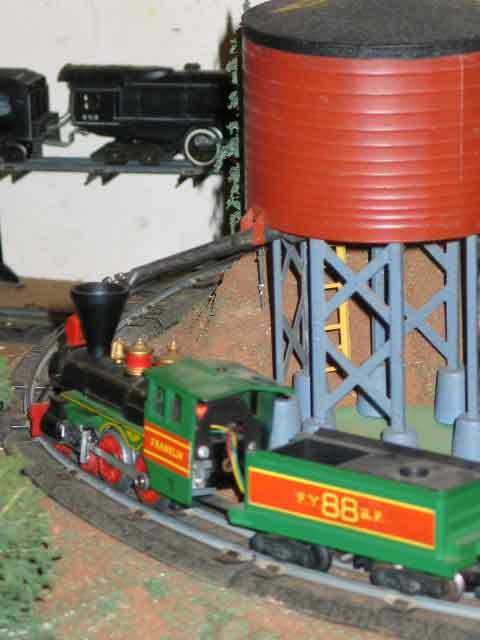 on the second side the tower and conductor discuss a hotbox problem. 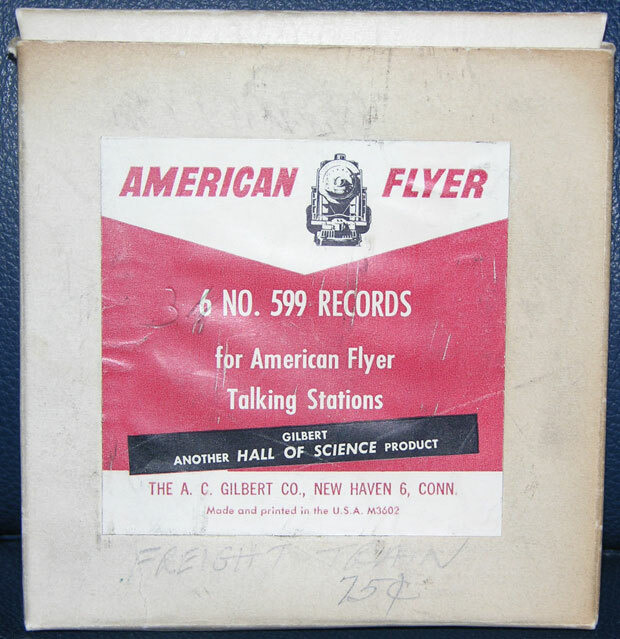 Records were shipped to dealers in 6-pack boxes like this.. 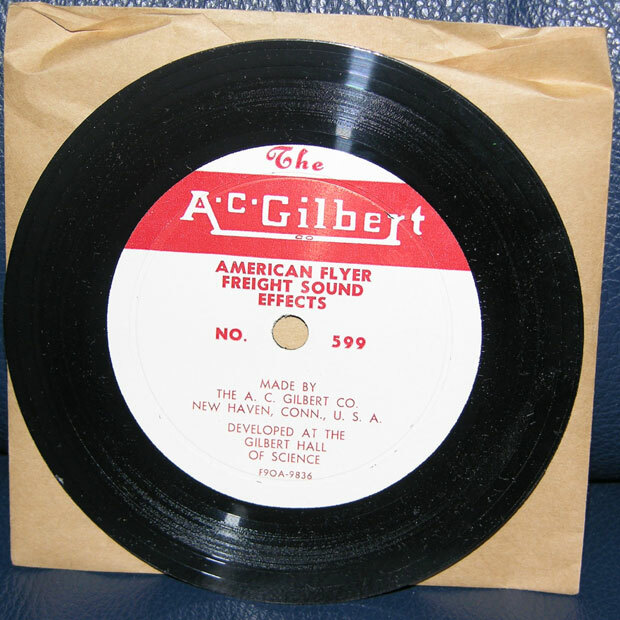 In 1969, General Mills acquired Lionel and American Flyer. This is one of their reissued #599 records. 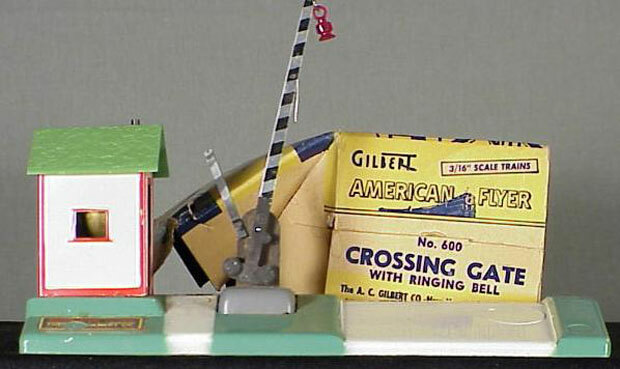 #600 Crossing Gate with 697 trip made in 1954 thru 1956.
off the #713 pickup arm as the mail car passes by. It's a wonderul thing to watch! 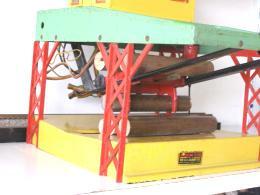 #751 Log Loader with yellow-painted Bakelite base made in 1946 & 1947. 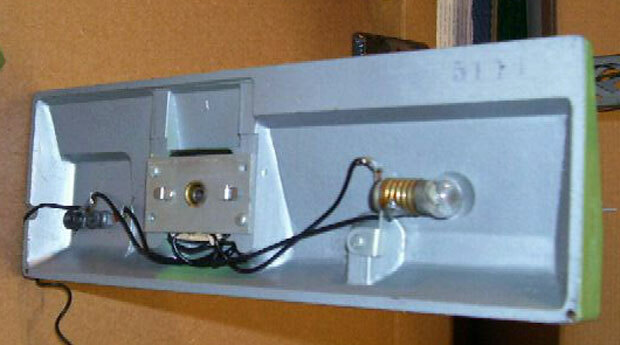 Notice the solenoid wrapped in red electrical tape on the right, under the upper deck. It pulled the log cradle up to the cart on the ramp. but I have been told they were actually painted in 1947 thru 1949, and the switch wasn't made until 1950. This one is from 1950 and it's unpainted. Does anyone have an unpainted black base from 1947 or 1948? And does anyone have a painted black base? 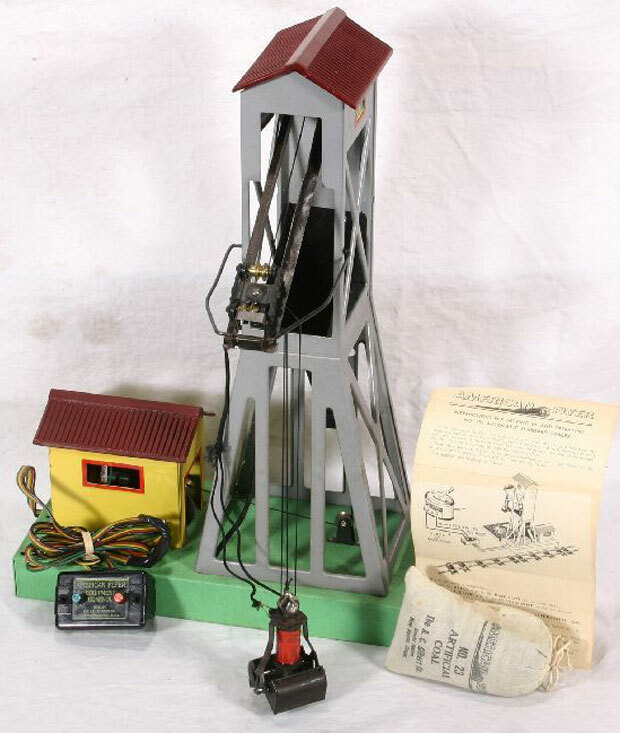 Can you positively identify the year? 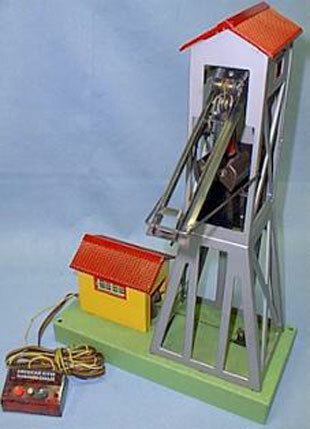 To improve its operation, Gilbert made a mechanical design change in 1951. 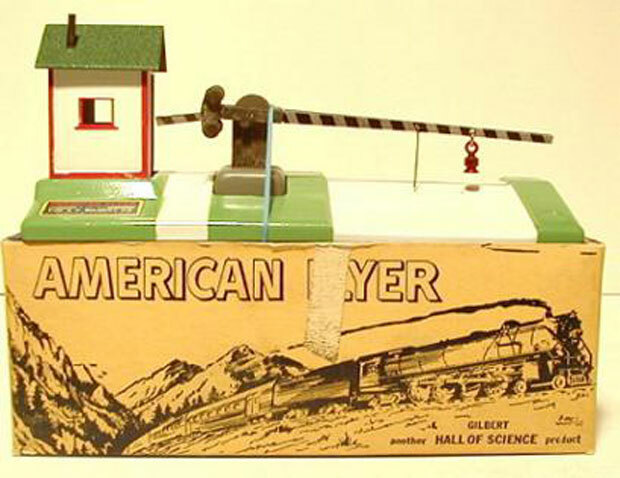 The improved unit was sold as #751A in 1951 thru 1953. It's hard to tell the difference unless you know exactly what to look for. 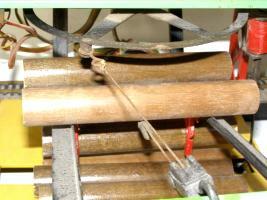 Instead of pulling the cradle up, the #751A solenoid pushes the cradle up. the #751 deck surface above is clear (no rivets). 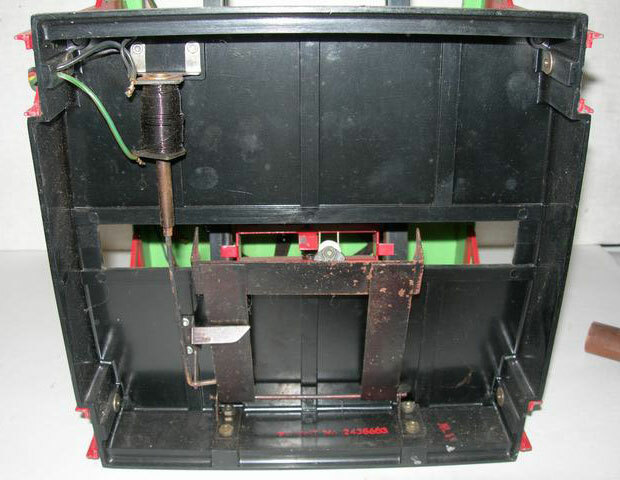 Contrary to what Greenberg says, it had a black Bakelite base as stated in the TM Guide. Both books say it was painted, but I have been told it was really unpainted. Watch this space while I confirm what's right. 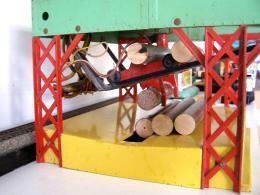 The #717 log unloading car was sold separately. 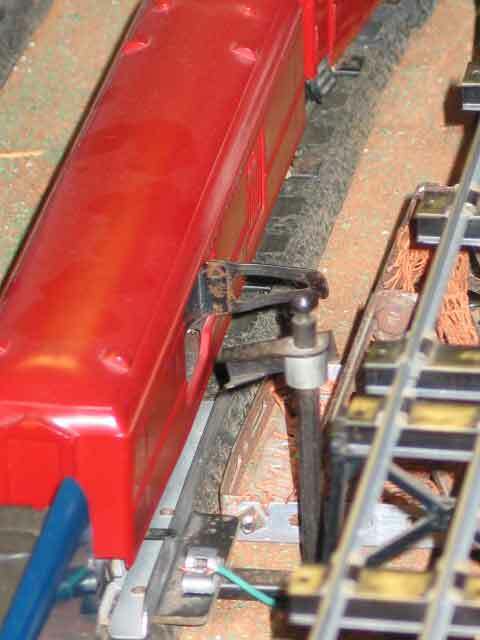 Here's a shot from below that shows the solenoid and mechanical linkage. No question about it: that base is Bakelite, not metal. #752 Seaboard Coaler with two-button control and a bag of coal; it was made in 1946 thru 1950. 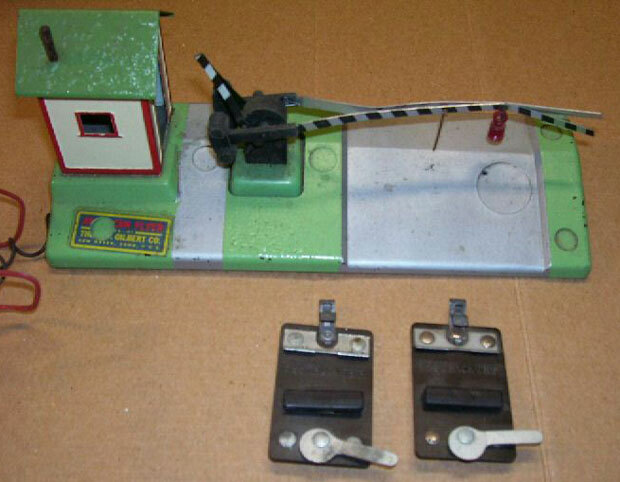 From the other side, you can see how it operated. 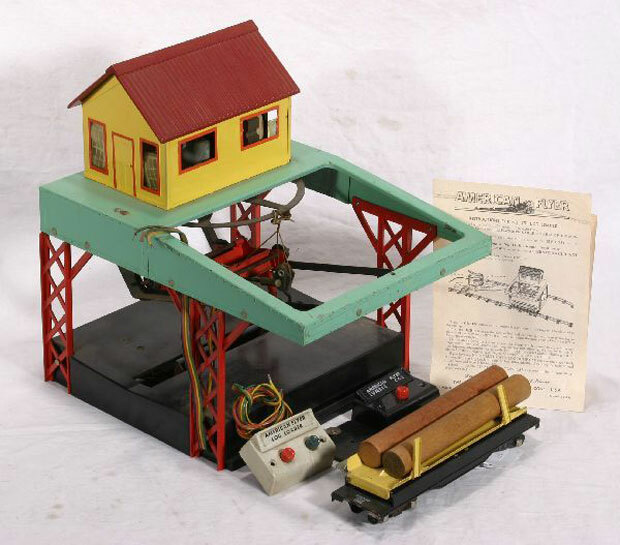 It was intended to be installed between two tracks. 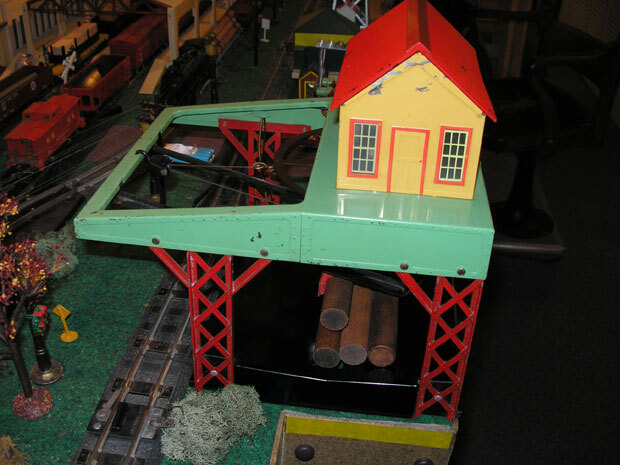 The scoop picks up coal from a car on one track, or from the tray into which a dump car unloads. The scoop then lifts the coal up to the chute that delivers the coal into a car waiting on the other track. 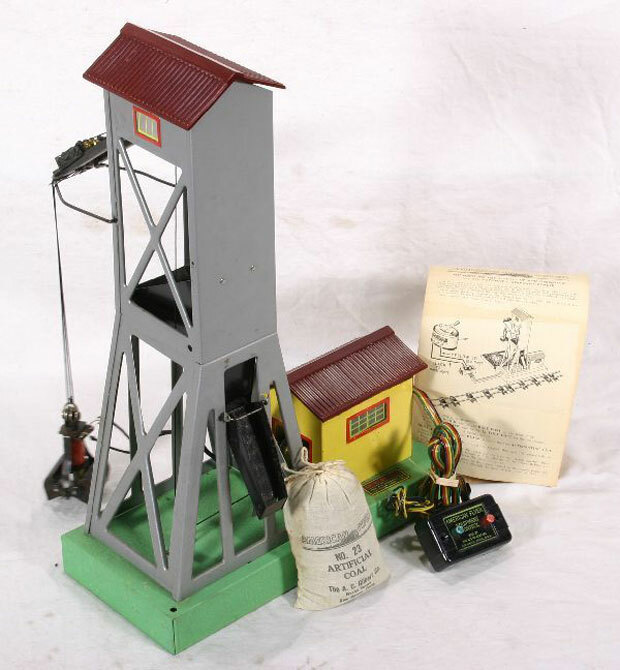 made in 1951 and 1952.
the #752A had a bin at the top of the chute. The third button opened the trap door at the bottom of the bin. It helped, but not much. 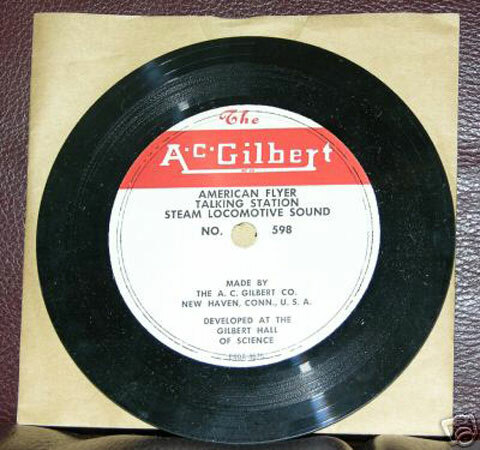 So Gilbert developed a wholly redesigned Coal Loader, the #785, in 1955.